I have seen some amazing fabric wallets on the web. The sites that interest me seem to have lots of beautiful handmade things! Part of me wanted to make one, the other part was a little intimidated. This is because some of the wallets I saw were perfectly constructed while others were, how do you say, made with love. I make things that are not perfect, quite often actually, they don't make the blog, but I did hope to make a near perfect wallet. In February, My youngest son asked for his very own wallet. I know they sell wallets for kids in stores, but I don't always see them, so I thought it was the perfect time to try one out. I read a lot of tutorials, but decided to draft my own pattern. I made my own bias tape for the first time too, making the bias tape was way easier than I expected. Overall I am thrilled with his wallet. I am happy that it is not mine. Two things that I didn't like; my own pattern, I work well from other peoples patterns, it is best to stick with it, at least until I get a good feel for what I am doing and secondly, the awesome bias tape. I am not very good at sewing it on.﻿ There is no picture of the wallet, but it is loved and appreciated. 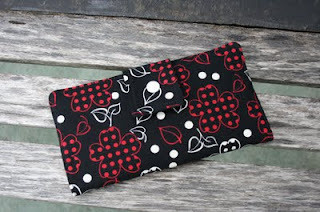 Fast forward to this week, the blog sew-a-long challenge is to make a wallet! There were a couple other choices, but wallet was a natural fit. I used this tutorial. I am super happy with the end product. 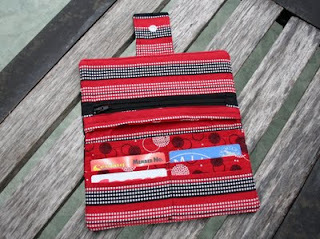 The bonus with this tutorial is that the whole wallet is turned and top stitched, no bias tape. That, I know how to do.